The Iraqi Parliament has prepared 13 steps in the wake of the Monday’s Kurdistan independence referendum staged by the Kurdistan Regional Government. 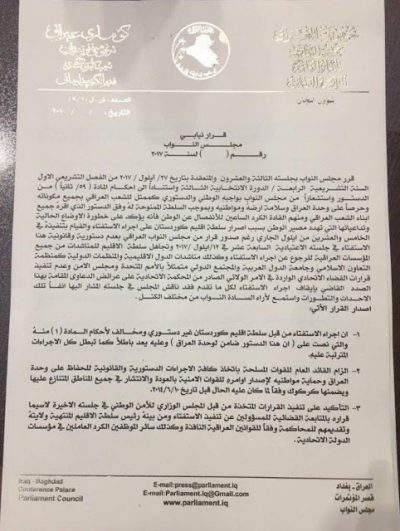 In its statement, issued on Wednesday, the Iraqi Parliament has pointed out that the unilateral referendum on Kurdistan independence, staged by KRG, is completely unconstitutional and therefore invalid. 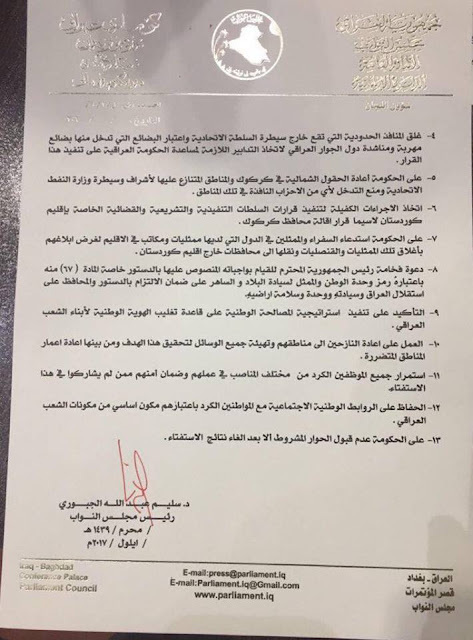 The Iraqi Prime Minister, considered as protector of Iraqi constitution by the Parliament, has become authorized to dispatch Iraqi security forces to Kurdistan and other disputed regions, Kirkuk including. All KRG and other Iraqi officials, Barzani and the notorious Kirkuk governor including, will be held accountable for organizing the referendum. The Parliament has also decided to close all borders, currently not under control of the federal government in Baghdad, and prevent all oil exports from Kurdistan. In addition, the Parliament demanded all consulates within Kurdistan province to close down, while vowing to continue with national reconciliation on a much greater scale. The Parliament assured that the Iraqi officials who did not participate in staging the referendum, have their jobs secured, while obliging itself to grans security of all internally displaced people, and gave them the rights to return to their places of origin. The Parliament has explicitly pointed out that social interaction with the citizens of Kurdish origin must remain unaffected by political situation in the country and the referendum results. At the end of the statement, it was said that the dialogue on solving the crisis will in no way continue unless all referendum results are nullified.